Just bought a Cape May house with a maybe 5 year old 19000 gal in ground vinyl pool. Had local pool service come to open it and they removed plug from skimmer that they shouldn't have. 4 days of bringing water level up to use pump to clean and found a sinkhole between main drains about a foot deep. Know what that plug was there for now though. Long question short, after all that has been talked about the sinkhole, I just want to make a small hole into it, and inject it with maybe sylcon and thats that till I replace the liner. SO, how do I get this sylcon to INJECT and what type? Any other info would be great too. Hi John I have no idea how that would work or how you would do it. The water pressure at the bottom of the pool is very strong. If the sink hole is resting on solid ground you have very little chance of raising the liner even a smidgen to get something under it. If the sink hole under the liner is not solid you run the risk of the liner tearing beyond your slit and water filling up any space available very quickly. This is not something I would try, if it were me. How does the skimmer plug relate to the sink hole, you lost me there? Let me know if you find a way to do this. The skimmer hole that didn't have a plug let the fresh water I was filling the pool with follow the liner to it's lowest point down at the main drains and gave me the sinkhole. John This is still not making sense. Are you saying water was getting in behind your liner? If so, how? Or are you saying the water went down the skimmer pipe to the drains and caused the hole? This would only happen if you had a break in the pipe. Maybe I am not understanding your skimmer plug. I am thinking of a plug inserted into the bottom of a skimmer that is securely mounted to the wall of the pool. That might be why this is not making sense. The skimmer has two pipe holes, one for the pipe to the filter pump and one right next to it, pool side, for other app's as in main drain or equalizer line. The skimmer we have ONLY needs the filter hole. The other has no use and had a plug in it. It is a direct opening to the backside of the liner and the earth. It is the hole that was unplugged by the pool guy's when they opened the pool this season. I had this service performed for $225.00 so that I would learn the proper way of opening our pool. I'll tell ya I sure know how to open a pool now though. Hi I had not considered the dual port skimmer, thanks for explaining. If someone had unplugged my equalizer line without making sure it was connected to something I would be fuming mad. I sure wish I had an easy solution for the damage done. I just re read first reply to this sinkhole issue, in it it said that there is a lot of water pressure at the bottom of the pool. It got me to thinking. When I had to check for leaks in the main drain because of the location of the sinkhole, one of the test's I did was for pressure. This was a two fold test, 1. for water pressure in drain line and 2. air pressure in the drain line. The starting test was water, as it was already there. It was 3 lbs. Next was air. Just blew out the water, plug drains and pumped up to 6 lbs. Let stand for 4 hours. No pressure loss, no leak. Now the rub. Three pounds of water pressure at bottom of pool. I think that a pool liner is basically stuck between a 'rock and a hard place' and that when either side moves it being only a layer it just goes for the ride. If I were to put a open plastic bag over my hand and put it into the pool, just how much force would be needed to change its shape? Not very much at all. This is why I feel injecting behind the liner, while pool is full, is very do-a-bul. But with WHAT? Water doesn't compress, which is great, but would only seep away if injected behind the sinkhole. Need something almost liquid or liquid. Remember it has to be pump-able for me to get it in there. If you know or even take a guess what I might could use as in material let me know. Thanks. Hi John Water has some strange properties, why it will not hold a bag flat against the bottom is beyond me. But I do know a little about the weight of water. An 18' pool with a 48" wall weighs about 31 tons. That equates to nearly 250 pounds pushing down on every square foot of the pool. 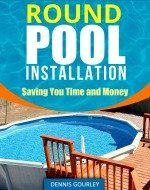 Your pool holds a lot more water than an 18' so your square foot weight is likely a lot more. I had a customer with an 18' pool get careless with a garden hose and washed out their cove. It was just a small area where the liner sank, maybe 6" x 6" right at the edge of the pool. I thought it would be an easy fix and volunteered to come by and fix it. I had a bucket of sand and thought it would be a piece of cake to work that under the bottom rail and raise the liner thus rebuilding the cove. I had an opening under the rail just big enough to get one hand in. Once my hand was in I tried pushing up on the liner. Man, it was just like pushing up on a 200# bag of sand, it would only budge a little. After an hour of pushing, and raw knuckles, I had the liner up high enough to keep it off the bottom rail and make the pool safe for use. The kids could use the pool for another month and then we drained the pool and fixed it right. My lesson was never try that again, sink holes require a nearly empty pool to fix properly. My guess is if you were able to inject something under the liner, the ground would give way before the liner raised up. I have had this discussion many times over the years I have been doing this. The only solution that even sounded close to reasonable was to fill the indentation with something and patch over top of it with a large sheet of vinyl, and I have a lot of questions about that method. Either that or find a way to live with it until the time comes for a new liner. A couple more examples of the power of the water pressure, the pool I used an an example above, had the sinkhole been caused by a small hole in the liner, that small hole soon becomes a big hole and within minutes the entire pool has emptied through a 12" slit. It happens so fast. Another example is of a pool I know of that had a small hole in the bottom. Turns out there was also some unstable ground underneath the pool and the liner burst into about a 3' slit that went straight into the ground. Luckily no one was in the pool. Back to your pool, if the ground is solid under your sink you are probably fine to leave it as is. If you can poke the liner at the bottom of the hole and not feel something solid, I would start draining asap. The bad part of all this, in my opinion, is that a correct fix will mean a new liner. That's a very expensive mistake someone made. Vinyl liners loose their elasticity after a few years. The chance of being able to drain, make repairs, and refill are slim, depending on the exact age of the liner and how much direct sunlight you can put on the liner during the process. Keep me updated, would like to know how you proceed.